Open all the head, then enter ± 3 cm thick foam, with a width equal to the length of the bass drum, so that it touches both head. For long, for ± 1/2 of the circumference of the bass drum. Can also use a pillow or rolled towel then touched to the bass drum head. Then attach the batter head (skin beater hit the pedal). Turn the screw until the wrinkles disappear (turn by crossing sequence). After that plug resonant head (foreskin bass). Adjust the tension with batter head. To produce drum sounds good, it's good drumhead (skin / membrane) is replaced with a drumhead that good anyway. There are two types of basic materials maker drumhead, which DuPont and Toray. Drumhead with DuPont base material is the best choice. 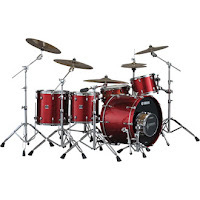 Some brands drumhead with DuPont base material is Remo, Evans, Aquarian, Dynamic, etc..
As for the tune tom drum, there are 2 types of tom, the rack tom (tom the position dependent), and a floor tom (tom that is placed on the floor and legs straight). For the batter head, do the same way with the snare batter head. Find a sound that fits with what you want. Do not be too loose, because the sound will break. And also do not be too hard, because the sound will be muffled. Then the resonant head (head down to the resonant sound). Create tension resonant head slightly lower or equal to the batter head. Make enough to produce sustained. Well, that's the way I do to get a good drum sound. Never be bored to tamper with and change the setting, in order to get the right sound to your taste. 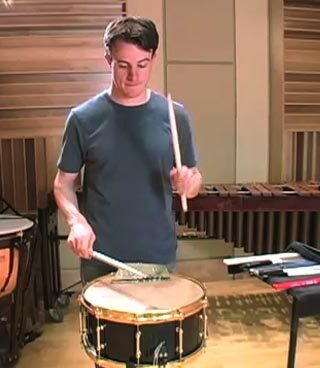 For snare drum tuning, there are 3 parts that need to be tuned in order to produce a good snare sound, the batter head (skin on which to hit), snare side head (under the skin to respond to the snare wire), and the snare wire (wire under snare , which produces the snare). Start with the batter head (upper shell). Remove the batter head of the shell (body drums). Flex head by pressing the edges to the inside (do not be afraid broken, batter head is very strong). After that, put your head on shellnya. Put the rim (metal ring), and turn the tension rod (bolt) using a hand with crossed sequence. For example, one bolt then bolt just opposite, and so on. Play all bolts crosswise order, until it can not be played again by hand. After that, turn the drum key (key players bolt), turn 1/2 rounds of all the bolts crosswise. Press the center of the head using 2 hands (do not be scared out of order), the emphasis is useful for mounting head has not changed. At the edge of the head (near the bolt) with a drum key, and make that all sound the same section. Do a few rounds until you get the desired sound. Then the snare side head (bottom shell). Do it the same way, but be careful with this because it is very thin head (do not do stretching and emphasis). Create tension head is slightly higher than the batter's head, in order to respond properly wire snare. In order to produce a good snare sound, make a snare wire tension so as to capture the sound of the softly blow though. Do not adjust wire too taut, as the snare sound will be captured. Drum musical instrument is a device that raises the voice of a long and impressive film with some type of object, usually a curved stick. Drums consist of a hollowed out piece that extends to the end of the drum, and tuning keys or pegs which stiffens or loosens the membrane to achieve different tones. In history, drums and cymbals played separately in military and orchestral music settings. 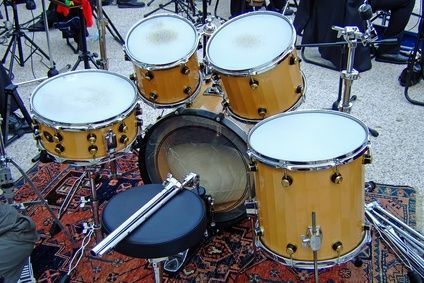 Initially, drummers played the bass and snare drums by hand, and then developed with the footpedals to play the bass drum. Hi-hat appeared around 1926. Metal consoles were developed to hold Chinese tom-toms, with swing out stands for snare drums and cymbals. In the 1930's, popularized efficiently which leads to a four piece drum base standard: bass, snare, tom-tom, and floor tom. In history, one of the drummers that can play two or more drums at the same time, people started placing groups of drums together for one musician to play. Louie Bellson using two bass drums, or the double bass drum. Gene Krupa, the first drummer to lead its own orchestra and thrust the drums into the spot light with a drum solo, the others will soon follow the lead. With the influence of rock and roll, a watershed appears, when Surfaris released "Wipe Out" and when Ringo Starr of The Beatles played a Ludwig kit on American television, the events that motivated legions to take up the drums. Drum major for Rock music began in the 1960s and gained momentum in the 1970s. In the 1980s, became very popular and the musicians who use a large number of drums and cymbals, and also began using electronic drums. In the 2000s, many drummers in popular music has returned back to basic four piece drum standards. Inside the drum can be seen the game an emotional person, but it also play drums but also vary According core of his songs being brought. From the world famous drummers like Travis, he played with relying on speed, agility and feeling very good tempo. In addition, other famous drummers such as Mike Portnoy, he played with regard knock songs played in order to vote in accordance with the music blows. Drum musical instrument became the foundation upon roomates every tune sounded so upbeat. Copyright © Music Zone . All Rights Reserved. Tutorial Wow Theme by CB Design.